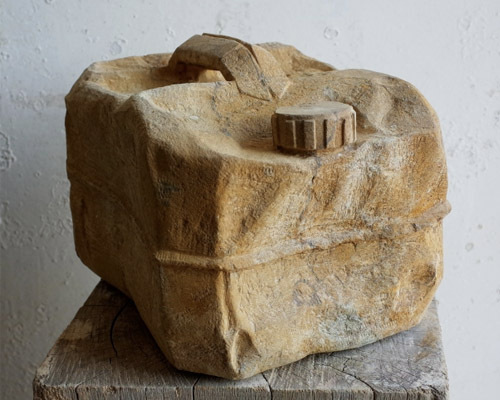 Tom Waugh is an accomplished British sculptor who creates hyperrealistic sculptures of waste and rubbish carved from stone and marble off-cuts. Objects are squashed, wrinkled and crushed - yet in his pieces are echoes of the veiled and draped figures of classical statuary. Philip Maltman is a Scottish born painter whose work explores the 'littoral zone' i.e. the shoreline or the area where the land meets a body of water. Philip uses markmaking to create a kind of order out of the chaos that characterises this zone. Gina Soden travels all over Europe to photograph abandoned buildings. The British photographer has become one of our most exquisite observers of decay. Her subjects are derelict asylums, schools and hotels, deserted castles and churches, and disused power stations. Emily Moore is a Scottish artist who paints mountainous and desolate landscapes. The artist uses acrylic paint, graphite and varnish on wooden panel. Emily plays with different textures, revealing and concealing the materials and mediums involved in her practice. Vikram Kushwah is a London based fine art and fashion photographer whose work has a romantic, and often surreal touch. His images have a strong sense of narrative, their stories inspired by memory and dreams. Fred Ingrams is a British artist who paints nudes and landscapes from life. Over the past few years his focus has been the marshy plains of The Fens, in eastern England. “It is a place”, says the artist, “full of strange stories, myths, strange place names and strange people”. Keith More is a Scottish artist based in London who draws hyperrealist portraits, each of which takes up to 400 hours to complete. Keith's aim is to produce artworks that stand up to hours of close scrutiny - until they reveal their secrets to the viewer. Àsìkò is a London born photographer whose photographs take their inspiration from Lagos, Nigeria, where he spent his formative years. The photographer's portraits straddle the boundary between fantasy and reality, responding to his experiences of identity, culture and heritage. Kareem Rizk is an Australian collage and mixed media artist based in Denmark. Kareem uses source materials such as old books and magazines, along with vintage postcards, brochures and catalogues to create textured and multi layered works that are nostalgic at their core. Jenny Boot is an acclaimed photographer from the Netherlands. She started her career as a painter, but came to prefer the precision of photography. Jenny has created a seductive photographic world full of texture. Skin, feathers, lace and silk dominate her imagery. Maria Magenta is a Russian artist who paints figurative works and still ife pieces. Her work aims to connect the animate with the inanimate. By focusing on living figures in lifeless interiors, Maria explores the human condition and the nature of physical presences in defined spaces. Stella Kapezanou is a Greek artist whose funky and vibrant contemporary paintings are unmistakable. Stella puts an exotic spin on the seemingly ordinary habits and activities of our capitalist way of life, gently prompting us to think again about what we deem to be ‘normal’. 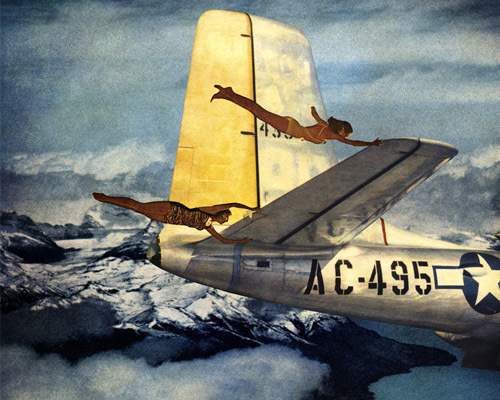 Alban is a French artist who explores wartime imagery. He draws inspiration from aircraft wrecks and industrial machinery - but his scale is distorted, his colours magnified, and his subjects themselves often invented. Nelson Makamo is a South African artist based in Johannesburg. His work is strongly influenced by childhood innocence. Nelson is particularly drawn to children in rural South Africa; he believes that they embody the peace and harmony we all strive for in life. Heja Rahiminia is an Iranian artist who works in black and white photography. Through stark contrasts, her photographs highlight social and political disparity. 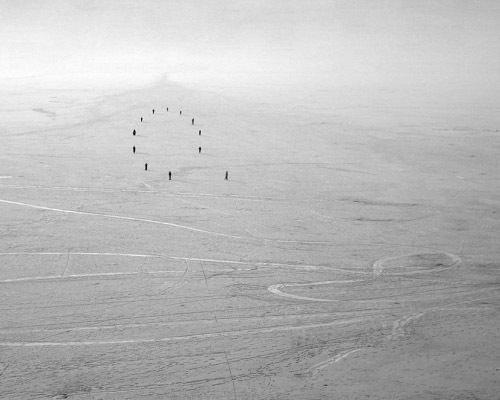 Against desolate expanses, trails of tiny refugee figures make their way across vast landscapes. Lebohang Kganye is a South African photographer who explores the contradictions of family history through the concept of family photo albums. Her works confront how family photo albums don't have a fixed narrative - they are open to us to reinterpret our past. Mitra Tabrizian is an Iranian-British artist and filmmaker. The artist aims to document the nomadic life of the local people that she interacts with. She's also interested in themes pertaining to corporate culture and migration. Peter Horvath is a Canadian artist who works in an array of new media art forms - primarily film and photography. By drawing on an archive of mid-20th Century reference material, Peter focuses on the deconstruction and recontextualisation of imagery through collage. Gustavo Amaral is a Brazilian artist who creates photographic collages that explore the human form. His works capture simultaneously the body in its external form, and the inner emotions and psyche the exist beneath its shell. Hiroshi Sato is a Japanese artist known for his realist paintings. 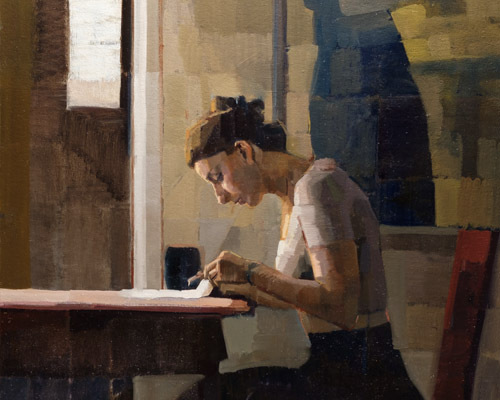 His primary subject is the human figure in interior environments. Hiroshi takes inspiration from artists present and past, his aim being to portray our various states of consciousness. Elizabeth Waggett is a British artist based in New York. Elizabeth's works challenge the viewer to confront the relationship between humanity’s preconceived notions of value and worth in our consumable world. By adorning each piece with gold leaf and precious metal, Elizabeth draws attention to our struggle between greed and purpose. Susan Schmidt is an Australian artist who paints contemporary realist works. 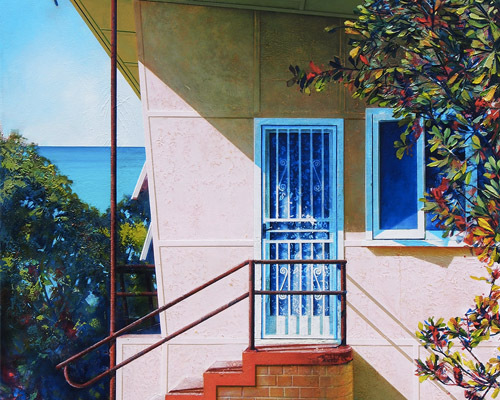 Her 'Seaburbia' series explores the cultural memory and heritage of the Australian beach house. Susan's paintwork is patterned, layered and rubbed back to achieve a weatherworn texture that recalls erosion of matter over time. Michelle Loa Kum Cheung is an Australian born artist who works in mixed media to create impressionistic landscapes on wood. Mixing gold leaf and liquid graphite with her paints gives her pieces a warm, nostalgic tone. Her current work is a response to her cultural identity as an Australian with Chinese-Mauritian heritage. Lei Sylviye is an abstract artist from Macao, China. His ethereal colour palette produces mystifying abstract paintings that relate to the problematic nature of virtual reality in the contemporary social context. Lee Yuan Ching is a Taiwanese artist who produces fluid, abstract paintings using watercolour and ink. Lee's unique blend of ink and paint gives his canvases an absorbing, liquid-like appearance.